Crowns are a cosmetic restoration used to strengthen a tooth or improve its shape. Crowns are most often used for teeth that are broken, worn, or partially destroyed by tooth decay. 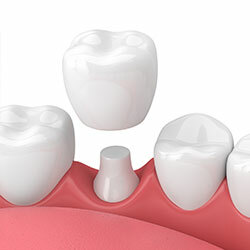 Crowns or onlays (partial crowns) are also needed when there is insufficient tooth strength remaining to hold a filling.